One stack of books includes Portrait of Orkney, Georgette Heyer's Regency World, Orkney Folklore,A Dance with Jane Austen,Orkney Tapestry, and I'm waiting for The Victorian Domestic Servant. The second stack consists of diaries and memoirs of the London Blitz, and those are going to be relevant in the fourth Stars book when I get around to writing it. Right now I'm taking a break from the Stars series to work on my Regency fantasy The Finwife's Tail. There are people who write two or more books at the same time - Cedar Sanderson has three going, as well as a day job and her art work - but I don't think I can. I feel schizophrenic enough already, reading about people being bombed out during the Blitz while writing about the Finfolk of Orkney; if I don't watch it I'll have my finwife observe the bombing of Scapa Flow! 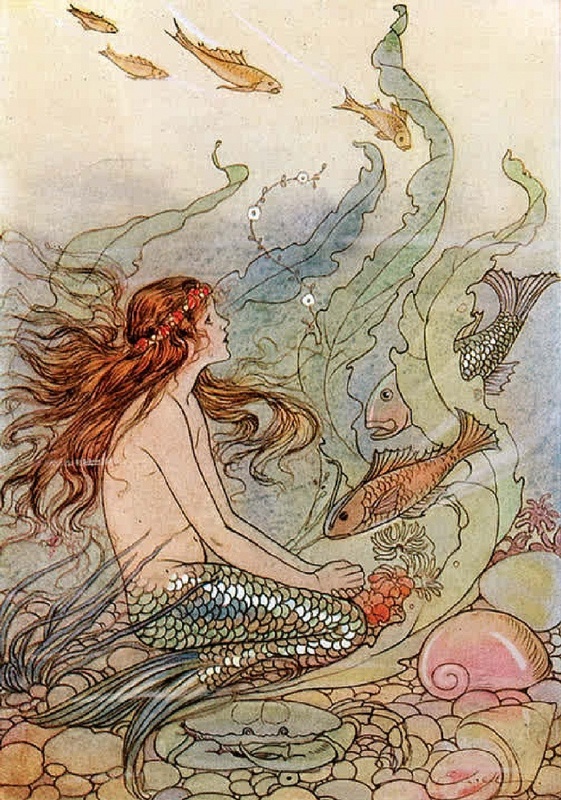 By the way, the Finwives are not exactly like traditional mermaids. They have two legs and all the other equipment of human women; it's just that they also have a long flowing tail sprouting from the lower back. 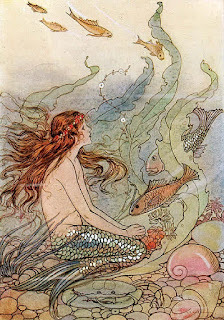 When swimming the tail is unfurled and when on land they wrap it round them like a skirt. I'm going to have fun getting a cover artist to illustrate that! Oh yes indeed! What an interesting description of your type of mermaid. Perhaps you should engage the services of one of the designers on Project Runway. I bet one of them could draw up such a thing, if not actually make it. ;-) That's a really beautiful illustration at the top.